Chinese language characters are hieroglyphic diagrams that imitate shapes of real objects. However, there has been several thousands of years of Chinese symbol history. So you may not be able to find easily today's modern Chinese characters resembling things because they have been symbolized and regulated for the sake of easy writing. Cang Jie created Chinese characters. 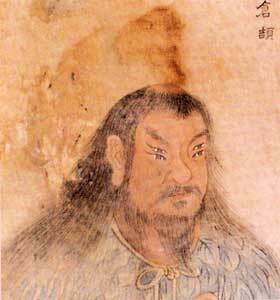 According to the records of ancient books, one of Yellow Emperor's Chancellors Cang Jie (仓颉) created Chinese characters. He lived at 6000 ¨C 7000 years ago and was said to have four eyes. Ancient book "Huai Nan Zi" said, "In the past, Cang Jie created characters, because of which grains fell from sky and night ghosts cried." After the creation, Chinese characters have experienced four major periods in the development. 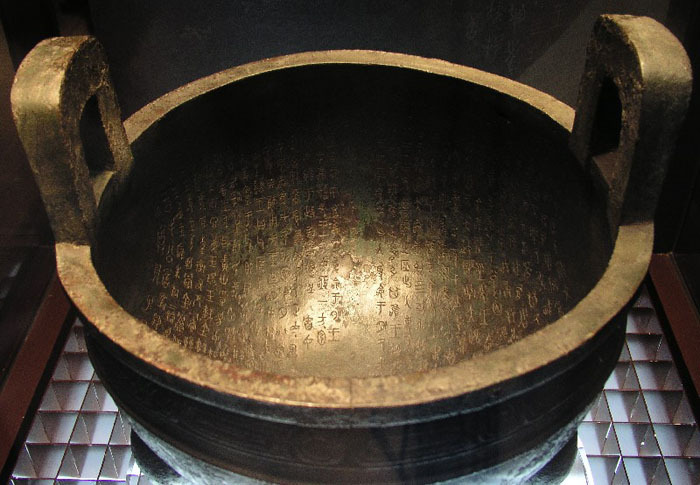 They are Tortoise Shell and Bone Inscriptions, Bronze Inscription, Seal Script and Regular Script. The shapes and structures of the Chinese characters in each period are different. The current Chinese character for "home" is written like this: . The way of writing this character at Qin-shi-huang's time (1st Qin Dynasty Emperor, 259 B.C.) is: . You can see that its top part is obviously a house roof. Then what is the thing in the house? Actually it is the charcter for "pig". See the way of writing this character in West Zhou Dynasty (1046 B.C.): . Oh, this is really a picture of a pig. So here you will understand the Chinese symbol meaning of the character "Jia"(home), which means a house with a pig inside. This was exactly the way of life in primitive period of one who had a home: having a shelter, and breeding some livestock. The way of writing this character in the Inscriptions on Tortoise Shells and Bones is like this: . Actually at that time, there were several variations of writing the pig inside, one of which even has bristles at the back! Xiao Zhuan characters inscribed on Yi Shan Bei. Qin-shi-huang (the First Qin Emperor, 259 B.C. or 210 B.C. ), after united China, found that Chinese characters in different areas were very complicated and in varied forms. So he initiated an act called "Write in same characters". He commanded Li Si to implement the work. This was the very first time to standardize the writings of Chinese characters in history. This process changed the strokes of earlier Chinese characters from having many turns to being well-regulated and convenient for hand-writing. These standardized Chinese characters are called Xiao Zhuan or Small Seal Characters. The right picture is a copy of Xiao Zhuan characters inscribed on the Stone from Yi Mountain (Yi Shan Bei). They look beautiful, don't they? Kai Shu by Ou-yang Xun. Kai Shu, also called Regular Script, is featured for its square outlook and straight strokes, which is why it is named as Kai Shu, the Model Font. It started from East Han Dynasty (24 A.D. ¨C 220 A.D.). This is the font that are mostly used today. There are quite a few well-achieved Kai Shu Calligraphers including Yu Shi-nan, Ou-Yang Xun, Chu Sui-liang, Yan Zhen-qing, Wang Xi-zhi and Liu Gong-quan etc. These calligraphers have left many stone inscriptions if their writings, which are the original models for today's people to learn Chinese character writings from. Please note that the Regular Script addressed here only refers to the "Traditional Chinese". 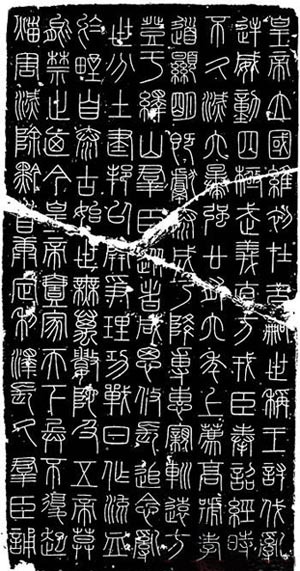 The so-called "Simplified Chinese" is a totally different thing created by the Communist Party, which has lost and damaged the essence of Chinese characters as a unique system of shape-imitation symbols. See my Chinese Language page for details on the comparison between Traditional Chinese and Simplified Chinese. Actually even nowadays, many calligraphers like to write in Xiao Zhuan font in calligraphy works because Xiao Zhuan has the combined merits of easiness in writing and the earlier Chinese characters' resemblance to shapes of real objects. This feature makes Xiao Zhuan characters look both beautiful and meaningful. This is also the font that many Chinese people like to use for their seals. Find the Chinese character you want through an English-Chinese dictionary and copy it in to clipboard (highlight it using mouse and press <Ctrl>-C). Go to this Chinese Etymology site. Paste the Chinese character in clipboard into the search box in this web page and click the [Etymology] button, then you will see your name character's ancient forms. As examples, I have listed below some characters' ancient forms. You can see the Chinese symbol's evolving history from them. Go to top of page "Chinese Symbol History"
Return from "Chinese Symbol History" to "Foreigners in China"